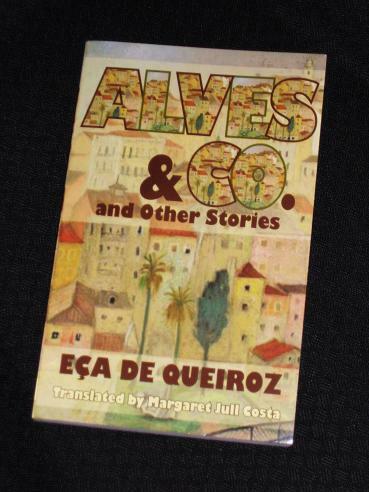 Alves & Co. and Other Stories, translated (as you can see from the photo) by the wonderful Margaret Jull Costa, is a slender volume of writings from one of Portugal’s great writers. The collection consists of the titular novella and six short stories, bringing it up to about 170 pages in total, and it’s an excellent starting point if you have never come across the writer before. Poor Alves immediately sends his wife back to her father’s house and begins to consider how best to avenge his honour. However, despite his initial overblown ideas of dramatic recompense, he gradually begins to reconsider. Is giving up his position in society for revenge really worth it? Or could he, perhaps, learn to live with the pain of betrayal? This novella is an excellent first encounter with Eça de Queiroz, and it is especially interesting to compare his ideas on the importance of redeeming one’s honour with those of other great nineteenth-century European writers. Alves’ friends’ rather half-hearted attempts to arrange a duel can be contrasted with the rather more straight-forward proceedings in books like Phineas Finn or Effi Briest. Also, our Portuguese friend’s attitude towards a cheating spouse bears little similarity to the way events unfold in novels such as Anna Karenina or Madame Bovary. Alves & Co. is an excellent novella, one I greatly enjoyed reading, but it did tend to overshadow the other stories in this collection (which I find is often the case when one story takes up a disproportionate chunk of a collection). The first two of these stories, A Lyric Poet and At The Mill, are thematically linked to the novella, relating as they do tales of people damned by unrequited love. These short tragedies perhaps provide a fitting contrast to the positive mood of Alves & Co.
Ah, I'm happy you liked the book! Also, our Portuguese friend's attitude towards a cheating spouse bears little similarity to the way events unfold in novels such as Anna Karenina or Madame Bovary. The other day I was reading an essay by Isaiah Berlin and he mentions that the Russian poet Anna akhmatova wrote that Tolstoy only killed Anna Karenina in order to please his aunts' sense of morality, but that he didn't believe in it. This is similar to what the Brazilian writer Machado de Assis wrote of Eça's previous novel of adultery, Cousin Basilio, that Luisa's death is not convincing, it's a convention. And I think those writers, Flaubert, Tolstoy, Eça, tried to do the best they could within the moral expectations of their age. So, yes, Alves & Co. is a new development. Alves' friends' rather half-hearted attempts to arrange a duel can be contrasted with the rather more straight-forward proceedings in books like Phineas Finn or Effi Briest. Duels in Eça are always ridiculed – either the duelists get cold feet or they recant and issue public apologies, they care more about safety than honor. My favourite example is in O Conde de Abranhos: one of the duelists is so afraid of the duel that he tips off the police, so when they meet to duel the police stop them. But this gets his seconds mad because it means a loss of honor to them. So they force him to fight in another duel. The way Eça describes it is hilarious! If you want to read his best novel, go straight for the The Maias, an excellent multi-generational family saga in the best 19th century tradition. If you want to inebriate yourself with laughter, To The Capital is a must! The Crime of Father Amaro may be the darkest novel he ever wrote and the protagonist is a heartless cad if there ever was one. Have you read Fontane's 1882 L'Adultera? Your review made me notice that Fontane's novella has a lot of thematic similarities to Alves. It's not as funny. The U.S. edition of Alves does not include the stories, nor are they to my knowledge published anywhere else. Grrr. Grrrr. Maybe you can order this edition from Book Depository UK? Still I don't understand why they don't just publish all the tales in one single volume. There are some other ten missing. Hmm. A name to file away for the future I think. It sounds as though there is a whole lot of cultural stuff going on that I know nothing about and I'm kind of stuck in 19th C Russia at the moment. There are just SO many wonderful writers out there; it really makes me sad to think that I probably won't even be able to scratch the surface in my lifetime. I agree with Miguel, the only book by this author I know is The Crime of Father Amaro which I read years ago and was so dark it left me feeling rather depressed and cynical! I'm intrigued to hear you say this is lighter than Effi Briest though. One to hunt out a copy of, I think.